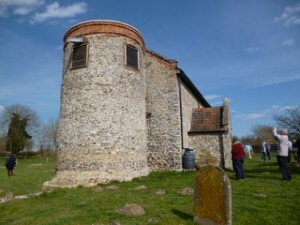 11 May, 10am start at Brome, then Syleham and Weybread. AGM at Weybread Hall Barn at 2.15pm. Bring a packed lunch. Brome is off A140 in Rectory Road. The following tours start at 2.30 at the first church. 1 June, Burnham Norton, Burnham Deepdale, Titchwell. 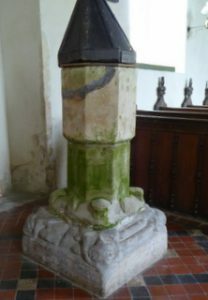 Burnham Norton church and font at Burnham Deepdale. 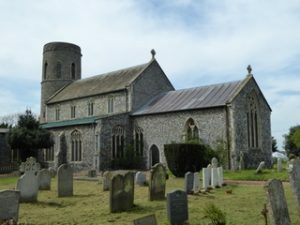 Burnham Norton is on A149 north Norfolk coast road. Gates open on Sunday, 9 June between 11am and 5pm. Entry, £4, for all gardens. 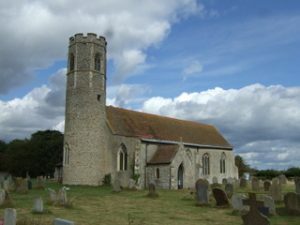 Proceeds for All Saints, Edingthorpe. Lunches/ refreshments, noon to 3pm. 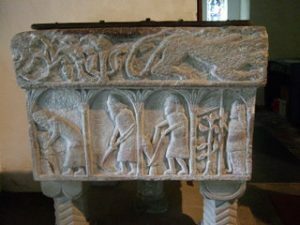 6 July, Bedingham, Woodton, Fritton St Catherine. 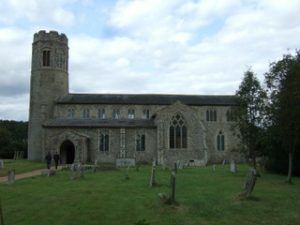 3 August, Cranwich, Feltwell St Nicholas, Weeting. 7 September, Intwood, Keswick, Swainsthorpe. 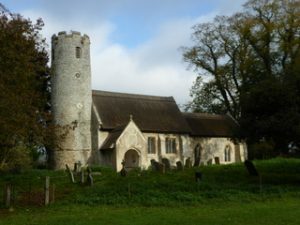 Intwood and Keswick churches. Intwood is off A47 Southern Bypass between A140 and A11. Everyone is welcome to join the tours and all tours are free though donations are encouraged at every church. 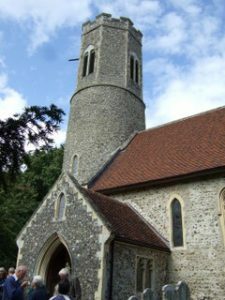 Teas will be provided by one of the churches during each afternoon. Further details from ‘Lyn Stilgoe 01328 738237. 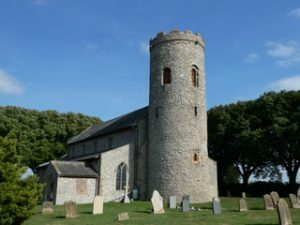 Round tower churches tours 2018. 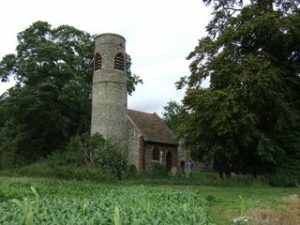 12 May 2018: 10am Norton Subcourse, Thorpe next Haddiscoe, Haddiscoe, before AGM at Haddiscoe Village Hall at 2.15pm. 7 July 2018 East Lexham, Shereford, Syderstone. 4 August 2018 Thorpe Abbotts, Needham, Rushall. 1 September 2018 Worthing, Bylaugh, Haveringland. 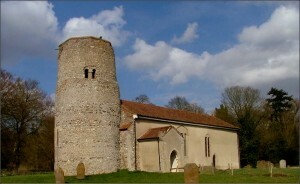 Simon Knott’s amazing websites with photos and information about Norfolk churches is www.norfolkchurches.co.uk. Everyone is welcome to join, and the Tours are free, though donations are encouraged at every church. 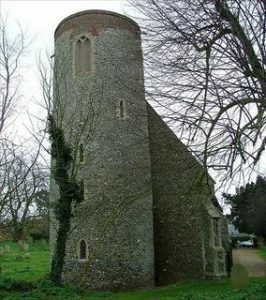 Tea will be provided by one of the churches during each afternoon. Further details from ‘Lyn Stilgoe 01328 738237. 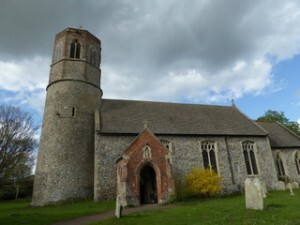 The programme included talks about church porches, formation of Diocese of St Edmundsbury and Ipswich, and a tour of Stradbroke church lead by Roy Tricker. 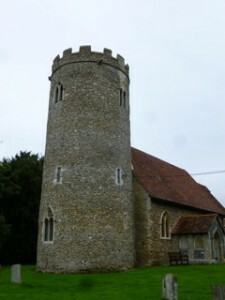 A report on the Study Day was published in December 2018 Round Tower Magazine.